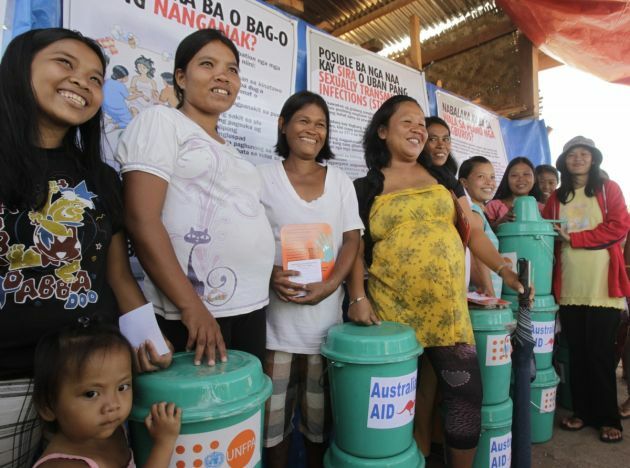 (Photo: Reuters / Erik De Castro)Pregnant women smile after receiving buckets containing hygiene kits from United Nations Population Fund (UNFPA) at an evacuation centre in Cateel town, more than one month after Typhoon Bopha hit Davao Oriental in southern Philippines January 16, 2013. The United Nations and other humanitarian aid agencies assessed the situation on Wednesday in the areas most affected by Typhoon Bopha in preparation for plans for a longer term humanitarian assistance and rehabilitation of the affected provinces, UN acting humanitarian coordinator Ugochi Daniels said. Working in alliance with churches is crucial strategically for international organizations, a senior United Nations representative said at the recent assembly of the Latin American Council of Churches. "Sustainable development rests in people, with women empowered, with young people engaged, with people of all traditions, faiths and cultures living in dignity and rights," said Dr. Kate Gilmore, director of the United Nations Fund for Population Latin America. She was speaking in Havana, Cuba, on May 21 at the 6th Assembly of the Latin American Council of Churches (CLAI), said the World Council of Churches, with which it is affiliated in a statement Thursday. The theme of the meeting of the highest governing body of the regional ecumenical church body was "Affirming ecumenism of concrete gestures." Gilmore's presentation was part of the assembly where she spoke on Churches and Sexual and Reproductive Rights, addressing some 350 participants. She shared figures about the situation of young pregnant women around the world and pointed to the urgent need to continue the process inaugurated by the Cairo Plan of Action. This was the outcome of the 1994 UN Conference on Population and Development. At that conference in Cairo, the WCC urged "open, constructive dialogue" among the churches on issues of reproductive health, particularly within the larger contexts of poverty, inequality, and women's rights. "As the [Millenium Development Goals] draw to a close, 222 million women still lack access to family planning," Gilmore said in speaking about an international plan to drastically reduce poverty by 2015. "Of the 210 million pregnancies each year, nearly 33 million are unattended, leading to 21.6 million abortions and causing 27,000 deaths each year. If we had family planning, we'd have 26 million fewer abortions and 1.1 million infant deaths avoided." At the Cairo conference the WCC said, "We would contend that it is better to place the issues of population in the context of improving the quality of life. "Quality of life is enhanced when people can attain their full potential, when the full spectrum of human rights is respected, when people are subjects rather than objects of policies, when they make choices in life and most all, when basic and spiritual needs are fulfilled." Gilmore affirmed that "the discussion of issues like reproductive rights and family planning with churches is urgent, essential, and compassionate." The UNFPA co-sponsored the meeting in Cuba and considers the alliance with churches "strategically crucial." Gilmore stated that in most cases the arena in which human dignity and empowerment are most important is also the most intimate: sexual and reproductive rights. "We must work in alliance," she said. "This is neither a UN agency agenda nor a particular government's policy. It is not the product one single faith or individual, but a work of the human community." The handbook was presented and shared during the consultation, and member churches were asked to express their commitment to use it partially and/or integrally in their pastoral work. Eduardo Campaña, one of the editors of the handbook, said, there is "a need felt in the churches and ecumenical organizations in Latin America and the Caribbean to include a real and concrete answer to the problems and consequences of an issue that is part of the daily life of our communities and people, especially women." "Our partnership with CLAI is about improving the fundamental dignity of people," she said. "You are agents of change and you are promoting efforts to reduce poverty, strengthening women, youth and indigenous people, and you are raising your voice for comprehensive sexuality education, reproductive rights, family planning, the prevention of HIV and the fight against sexual violence." The Latin America Council of Churches was founded in 1982 and has its headquarters in Quito, Ecuador. It currently brings together 188 Protestant churches and denominations from 20 countries. Its main function is consultation and coordination of pastoral work. In another important meeting regarding the serving of displaced people across the world, ecumenical organizations such as the World Council of Churches, the Lutheran World Federation and ACT Alliance were part of discussions hosted by the United Nations High Commissioner for Refugees. Attending were faith-based organizations on caring for refugees held in December. At that meeting UN High Commissioner for Refugees António Guterres, in his opening address said, "For the vast majority of uprooted people, there are few things as powerful as their faith in helping them cope with fear, loss, separation and destitution." It was the first time the high commissioner had convened a meeting with particular focus on the contribution of faith-based organizations in caring for refugees. Participants included representatives from Christian, Muslim, Jewish and Buddhist faiths, and from state and non-governmental organizations (NGO). "To be a secular organization dealing with refugees does not mean UNHCR should ignore religion, but we must respect and value the faith of the people we care for. […] to ignore faith would be to ignore its potential for preserving dignity and for finding solutions for the people we care for," Guterres noted.